There are 7 posts in this thread, and it has been viewed 5666 times. Football Frenzy. What do you think of it? 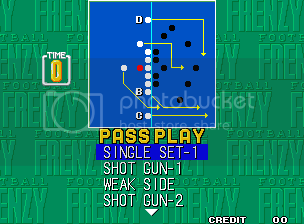 With regard to the Super Bowl, which just started today, we proudly present the only American Football game for the Neo Geo. 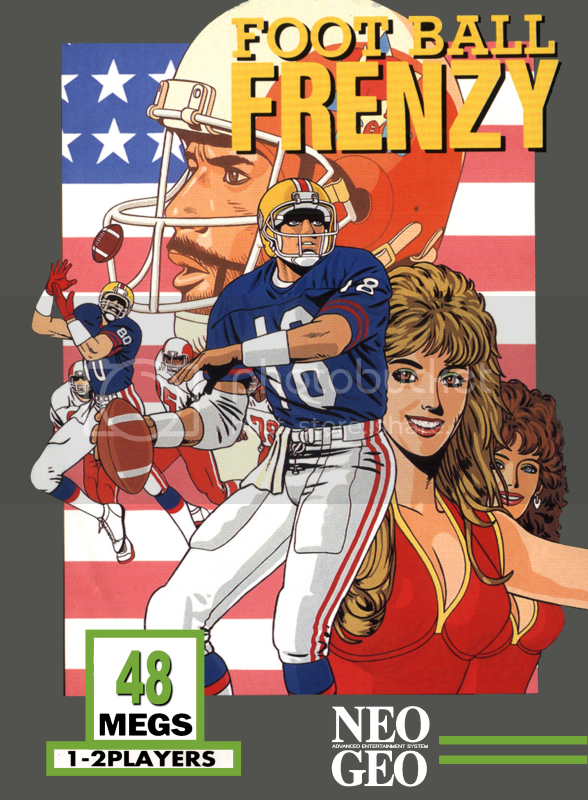 Football Frenzy, released in golden 1992, was also intended to enthuse the American Arcade visitors, alongside with other American sports-oriented games like Baseball Stars 2. To be honest, I don't know much about the game itself nor have I ever played it intensively. So I hope you guys have more to tell about it than my humble self. Has anyone of you played it back in the day? 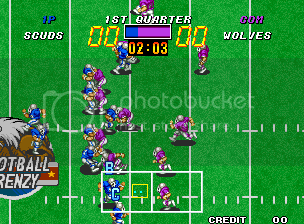 Football Frenzy is a two-player American Football arcade game released by SNK in 1992 for the Neo-Geo console. 2 years later, in 1994, SNK released the Neo Geo CD version. You can select from one of 11 teams, like the 'Hit Men', the 'Vipers' or 'The Bullets'. Upon request. Come on guys, let's submit some scores! Priest would be happy to hand out some medals to some worthy challengers! Never played it but I've been interested. Watching the video I find it rather annoying that you give it away when you are doing a pass play because it zooms out. Again I love the style of presentation these sports games have, everything is so exciting! I think it looks pretty good from the video but I get the feeling it would be short-lived fun. One thing: If you were playing this game in an arcade, then you would probably end up spending a lot of money to finish a match. The matches are made up of four quarters and at the end of each one I was asked to insert more money, even if I was winning. And after winning the match, it still asked me if I wanted to insert more coins to continue! If you were playing this at home then it wouldn't be a problem, but otherwise steer clear of it� unless you have a pocket full of money, or the arcade machine is set on free play! I'm not very interested in many sports games and haven't tried this one. Kinda looks like a chunky, cartoon-like variation of Midway's High Impact Football. Like RiKo, I suspect this game would provide some enjoyable moments for me, but then quickly lose its charm and begin collecting dust on the shelf. I'll give it a go via emulation and see how it holds up for a largely non-sports Neo player. I really do want to give this one a try at some point. 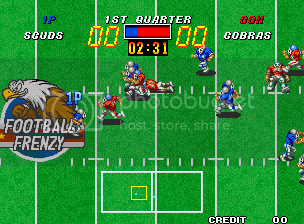 I've not been disappointed with a Neo-Geo sports game yet. But, I really like arcade style sports games. 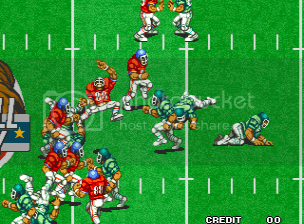 Football Frenzy does seem like one of the least popular sports games on the system but I've always enjoyed it. Graphics are nice and colourful, there's a good variety of offensive plays to choose from and the gameplay is fun. I like how the game zooms in on the action. There's a good amount of speech in the game too. You can't pick defensive plays but that doesn't really matter. As Kaz wrote in his review if you were playing this in an arcade it would seem a bit unfair having to keep putting money in even when you're winning. The default length of the quarters is perhaps a bit too short but you can of course change that in the operator menu. Not on the same level as the awesome Baseball Stars 2, Dunk Dream and Neo Turf Masters but still well worth checking out.